UBC Library’s Rare Books and Special Collections (RBSC) is pleased to present “‘The Iron Pulpit’: Missionary Printing Presses in British Columbia.” Featuring materials produced on missionary printing presses in British Columbia between the 1850s and 1910s, this exhibition situates its subject in contexts of Indigenous-Christian encounter, colonialism, and print culture in the province. The exhibition, until December 8, 2012, is located in RBSC, on level one of the Irving K. Barber Learning Centre, and is open to the public Monday to Friday, 10am to 4pm, and Saturday, 12pm to 5pm. A PDF of the exhibition catalogue, which includes an introductory essay, detailed item descriptions, and a checklist of extant missionary printing press imprints, is available here. “‘The Iron Pulpit'” was curated by Alicia Fahey (PhD Student, Department of English) and Chelsea Horton (PhD Candidate, Department of History). 1. When you first started this project, you worked together to come up with a running title for the blog posts and a graphic. Can you tell the story of how you came up with the “This is really random” theme? 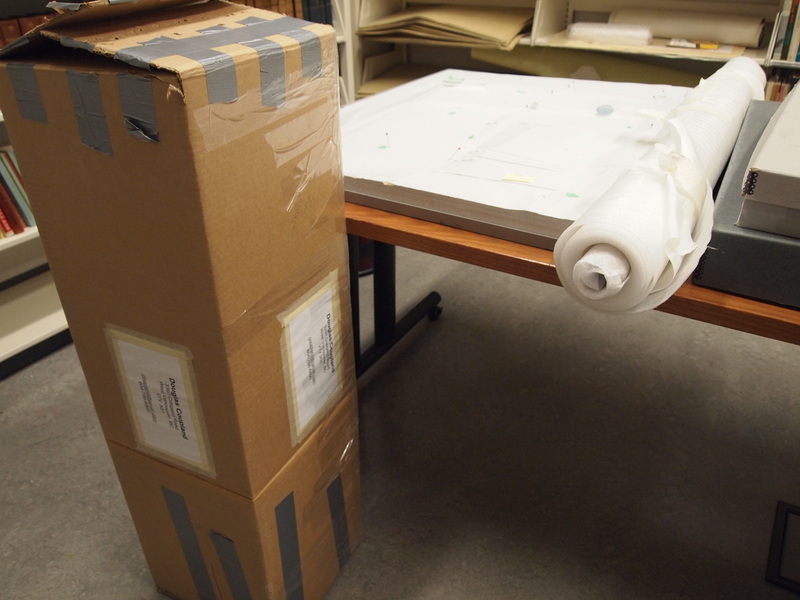 Group: When we first received the boxes and discussed our project plan, the three of us spent some time together on the first day taking an initial survey of what the accession contained – poking through boxes, oohing and ahhing, and reviewing our intended approach in light of what we found. We were amazed by the sheer diversity and seeming chaos of the accession as we first received it, and also delighted by some of the more unique finds we stumbled across! Everything seemed to be organized so, well… randomly. Naming the blog was in the back of our minds that first day, and when we came upon a box of t-shirts that contained one that said, “This is really random,” it felt like a sign. We were all very quickly in agreement that not only did it seem fitting, but that Coupland himself would probably appreciate the tongue-in-cheek humour of it. 2. Early in the blog posts, you discussed how the Coupland fonds seems to lack what archivists call “original order.” Did your opinion change as you worked through the accrual? Has this project made you think differently about how to approach arrangement with other archives projects? Group: We are fairly certain that what we received was a product of Coupland sweeping things into boxes, and does not necessarily reflect how these items were grouped and arranged around his workspace when they were still being created and actively used. Nevertheless, we feel that our approach was effective – we maintained the received physical order, but still managed to organize the materials according to a coherent intellectual arrangement (by series) that worked well with previous accruals. This way, a researcher can view a file list to see the received (physical) order, but they can also view the material grouped by the kinds of different “work hats” that Coupland wears (or functions he performs) – as an author, a playwright, a designer, an artist, and so forth. This project did make us realize the critical importance of the deposit interview. We were unable to conduct an initial accession interview to to ask Coupland about his work habits and spaces, his personal systems of organization and arrangement, etc. In the future, and especially with creative cultural workers such as Coupland, we would want to do our best to ensure that this could happen. This would give us a better sense of what we were seeing, how it was packed up, what we could expect to find, what it might relate to, and how much is likely to have changed between the original and received orders. 3. I’m guessing that before we even cracked the boxes open you knew this project would involve some pretty unique content. What is your favorite/most random/most surprising object? DG: I’m still hung up on the bejeweled hornet’s nest – I didn’t see that one coming. But other favorites for me included the baby Digital Orca maquette (file 179-05), and the cheese-encrusted pizza box with calligraphic doodles on top (file 179-24) – you just never know what you’re going to find in an artist’s fonds! LH: My favourite (if I have to choose) is actually a number of little things that cropped up periodically throughout the entire fonds – movie ticket stubs. Every now and then a box would produce a ticket stub (or two or three), providing a little glimpse into Coupland’s everyday life and, maybe, the ideas and images that were influencing him at that moment. These, among other things, received the tag Ephemera. SH: I was most surprised by the crusty pizza box that Dan mentioned above. I did not expect to find an item like this mixed in with all the other records we processed. Other interesting objects include two maquettes of his Digital Orca sculpture and a styrofoam “phantom” leg from his Terry Fox memorial project. Group: Actually, we found that our varying experiences and schedules worked really well together! We maintained a shared document throughout our work so we could discuss strategy when challenges were encountered, and generally reached consensus as to what we should do rather quickly. Because of the nature of this fonds it was actually really helpful to bounce ideas and questions off each other. There were a few challenges that popped up. The most significant was probably our experimental deployment of the taxonomic subject terms. In the end, we ended up needing to delete, move, and/or modify some of the tags that we had created on the fly in order to make one cohesive taxonomy. This isn’t surprising – we were working with a new functionality, but ultimately we think it came together really well. 5. Did you learn anything about Coupland’s artistic or writing practices that you think researchers will be interested or surprised to learn? Group: One thing in particular that amazed all of us was just how broad Coupland’s interests and artistic practices are. He’s got work in all directions, from his many novels, to his fashion and furniture design projects, to city planning – and his V-Pole project (see file 184-05), unveiled with Vancouver mayor Gregor Roberston earlier this year! As archivists though, we can’t really make claims about what will surprise researchers. Our job is merely to provide the best access we can to the materials, and leave it to the researchers to draw their own conclusions. 6. 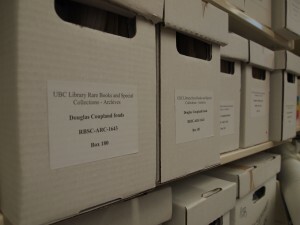 As archivists, we get the privilege of the “first view” of a person or organization’s work through their archives, but we ultimately pass the torch along to researchers, scholars, and even casual users who make the real connections. What do you hope researchers will get out of this collection? Group: Appreciation. Coupland is such a multi-talented artist, and there are so many unexpected items in this collection to surprise and delight researchers and fans alike. Context. To be able to see all the initial steps, the drafts, the sketches, the correspondence that precedes a finished work – this is invaluable to understanding the creative process of a creator such as Douglas Coupland. It would also be interesting if someone took the time to compare all the dates, travel stubs, and correspondence to figure out which projects were worked on simultaneously, which led to other projects, and in what ways an idea comes to full fruition. Best of luck to the researchers! Earlier in this blog, we posted about how we are implementing the use of taxonomies to help researchers navigate the new accrual to the Douglas Coupland Fonds. We’re just putting the finishing touches on those tags now, and thought we would offer our readers a first look at what we’ve done. To review: taxonomies in ICA-AtoM are similar to the kind of tags you’ll see in use everywhere on the web these days, such as on Flickr photographs, Amazon albums, and even blog posts such as this. In ICA-AtoM (the open-source, web based archival description software that Rare Books and Special Collections is currently implementing), these are also known as “access points”. When we create a tag (or access point, or taxonomic term) and associate it with a file, a hyperlink is created on the description page. 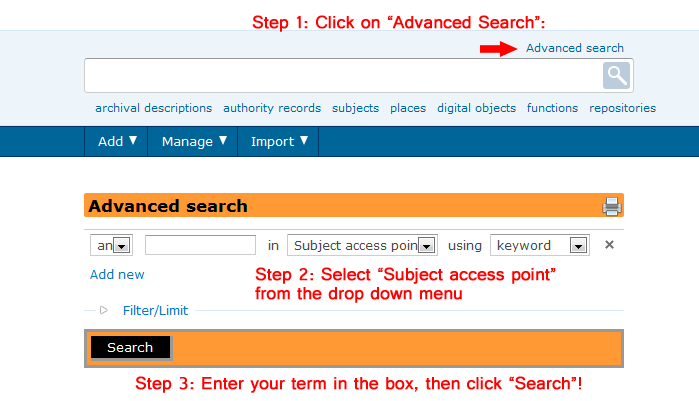 When you click on the link, ICA-AtoM will bring you to a search results page showing all other archival descriptions that also have been tagged. This is useful in several ways. First, all the tags we’ve used are indexed separately than the simple searchbar results, so if for example, you wanted to find materials on Generation A, a simple search will return all entries that mention Generation A in their description, including those from earlier accruals that haven’t been retroactively tagged yet (or anything we might have forgotten to tag!). Searching this way, you might find files 181-37 and 181-38, “Generation A manuscript”. As you might expect, you’ll find “Generation A manuscript” in the “Literary projects” series of the Douglas Coupland fonds. However, there are several files in the accrual that relate to Generation A but don’t mention the book explicitly in the description! They might be correspondence, or interviews, or book reviews, or even photographs – and might therefore be kept in a different series. A simple search for Generation A might never turn up these important related documents… but this is where the magic of taxonomies comes in. So if you are looking at file 181-37, “Generation A manuscript,” and you clicked on the Access point hyperlink, “Generation A,” you’ll be redirected to a showscreen listing all files from all series that we have tagged with the term. This way, you could find file 184-19, “Correspondence with Janklow & Nesbit Associates,” which contains a cover letter that originally accompanied Coupland’s agreement with Random House Canada for the publication of Generation A, or file 185-28, “2009 Rogers Writers’ Trust Fiction Prize award finalist certificate,” which you might not have known Coupland was presented for Generation A (he didn’t win the prize that year). You can also use this advanced search to search for multiple terms at once. Notice the dropdown menu before the search field, that contains “and”, “or”, and “not”, as well as the “add new” link just below the search field? These are powerful tools for building complex searches! Try out searches such as “Player One OR Massey” (will return you anything tagged with either of those terms – meaning you’ll get results about Player One as a book, and possibly anything Massey-related that Coupland has done that was not associated with Player One), or maybe “Generation X AND Publicity” to see clippings that Coupland has collected about his first novel over the years. Because ICA-AtoM’s taxonomy module is still developing, there’s currently no easy way to view all of the terms we’ve made use of in the Coupland fonds. But not to fear, we’ll be uploading a PDF of all the terms we’ve used for researchers to browse before the accrual goes live.